Easily update prices and items so your website and social menus are in perfect sync with your in-house menus. All in a Non-PDF, mobile-friendly format that looks great on all devices. Change once, and they change everywhere. According to research, “current menus with up-to-date prices” are what consumers most want from restaurant websites. 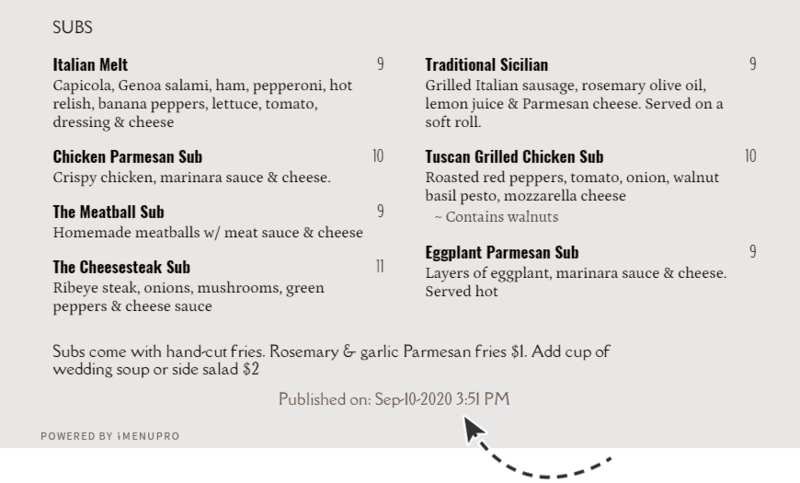 Let your customers know about upcoming specials or menu changes on social media (Facebook, Twitter, Blog posts, etc.) with automatic, real-time updates and no downloading required. Not just for restaurants: salons, spas, dispensaries and more can use it. 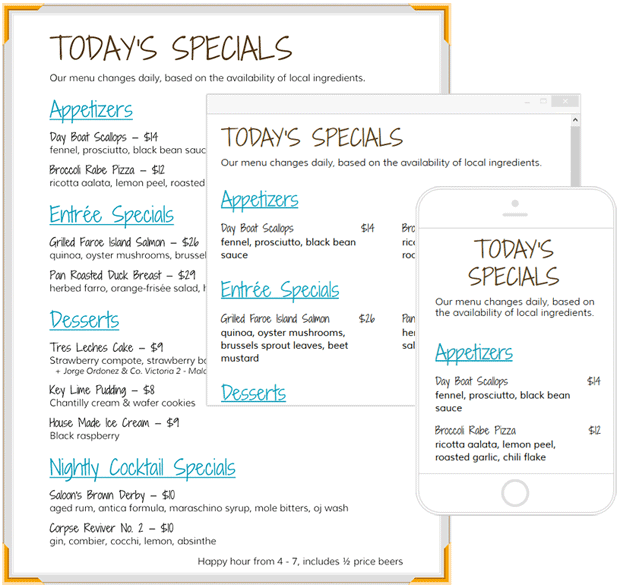 Any business that benefits from easily changing their list of services can update their online menus with iMenuPro's Menu Maker. 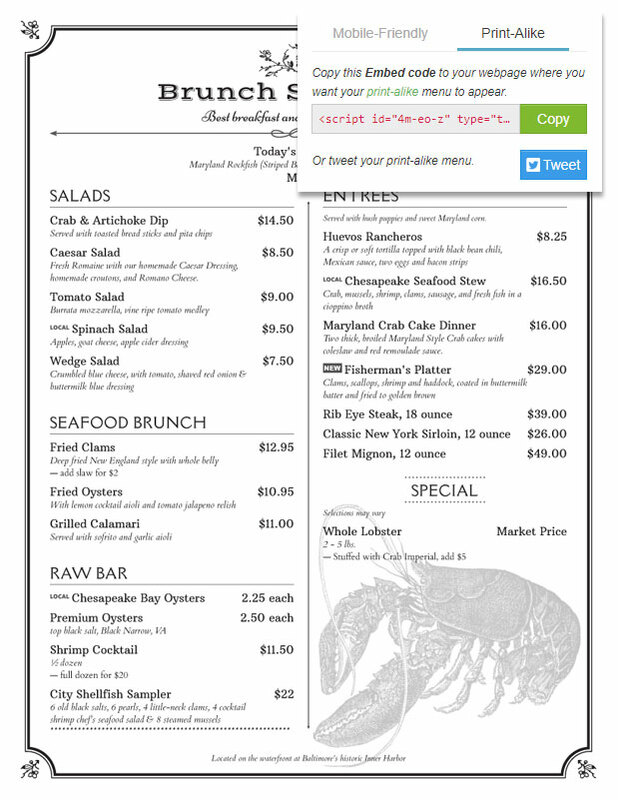 Sync your printed menu to your web menus so when one changes, the others do too. Why? 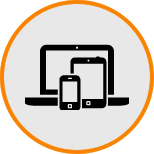 Because up-to-date online menus means more foot traffic at your business. Our previous menus were terrible, and I had to [send] every menu item and change to the third-party person, wait till he got around to making the changes ... iMenuPro has made my life so much easier because I am doing the work once, and there is no waiting and checking and then waiting again! Once I make a change, all my menus and my website are updated with a click.